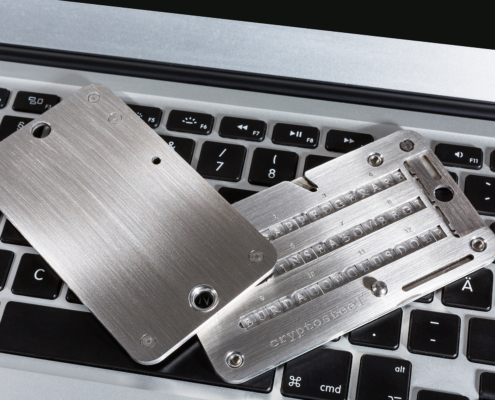 Cryptosteel is a pocket-sized stainless steel unit designed to securely store alphanumeric data of your choosing with no need for specialized tools or third-party involvement. Each Cryptosteel comes with its own kit of stainless steel letter tiles engraved on each side. Codes and passwords are assembled manually from the supplied part-random set of characters. You can store up to 96 characters worth of confidential information in minutes, guaranteeing the safety and privacy of your data. 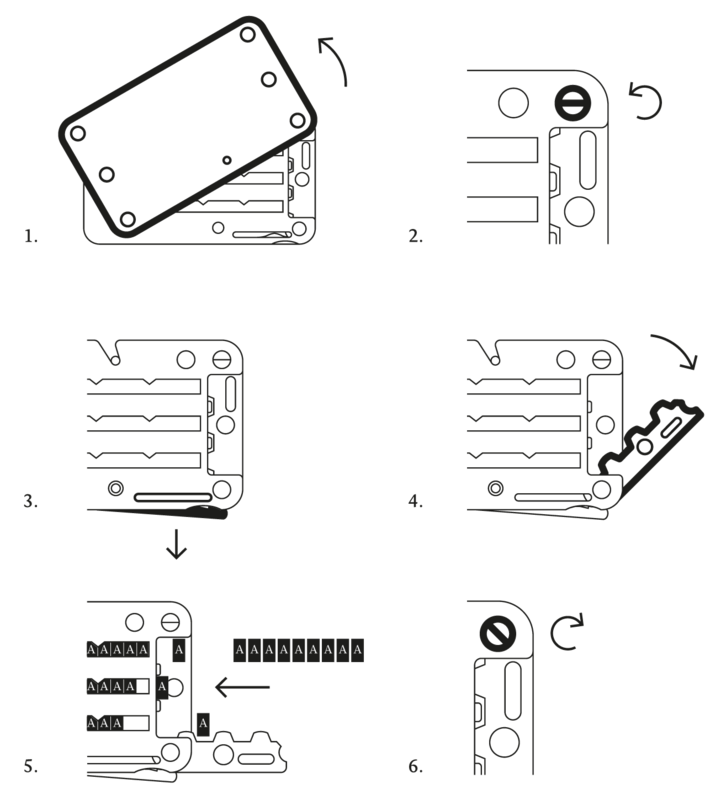 Once a desired sequence is locked into your Cryptosteel unit, it essentially gains the status of offline permanence, featuring resistance to physical damage, including fire, flooding, corrosive conditions, electric shock and impact from accidents. Cryptosteel comes in single packs and bundles, with each unit consisting of one Cryptosteel and one or more letter tile kits. Depending on what kind of data you wish to store, you can choose the best character set for you. If you need safe offline storage for your cryptocurrency recovery seed phrase, choose Cryptosteel Mnemonic. Your 12-24 recovery seed phrase is based on Bitcoin Improvement Proposal 39, known as BIP39, which allows use of a language-based mnemonic phrase to serve as your backup in the event your wallet gets lost or becomes unusable. The words are selected from a specific list of 2048 common English words. While not all words have exactly four letters, all are selected in such way that the first four characters unambiguously identify each word. This goes for the occasional three-letter word, too, in which the fourth character is blank. So if you have four tiles, you have your word. Cryptosteel Mnemonic can hold up to 96 characters, which is exactly what you need to store a 24-word list in BIP39 protocol. Each Mnemonic tile kit contains an optimised character count and spread for maximum functionality and ease of use. The kits are part-randomized for an extra layer of security. Fan out the hinged front and back panels. Turn the screw clockwise into horizontal position. Use a letter tile or small tool to press on the lever inside the long slot. Keep the lever pressed as you open the frame. Insert your sensitive information, making sure all filled rows are fully loaded. If you are storing a recovery seed phrase, use only the first four characters. If a word has just three characters, use a blank letter tile to fill the space. Use both panels. It helps to set the tiles out in order before you insert them into the frame. Shut the frame and twist the screw counter-clockwise into vertical position.